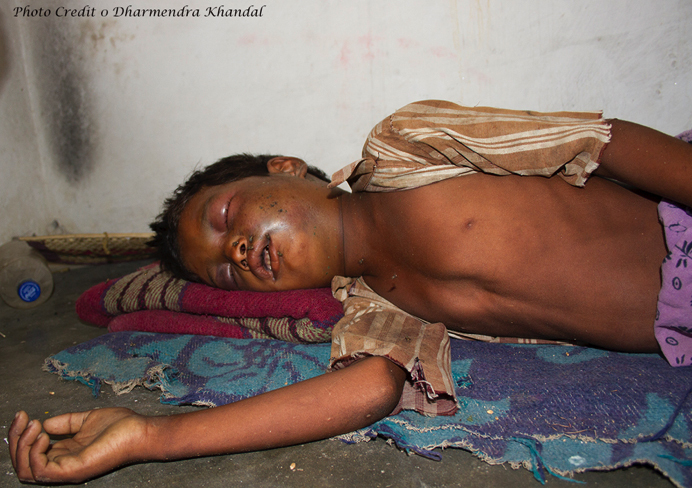 Near Ranthambore, one of the famous national parks of India, on 6th June 2014, 7-year old son of Radheshyam, a Mogiya of Andoli Village in Chouth ka Barwara, got bitten by a snake on his face. Typical of Indian rural scenario, he was taken to the local temple and kept there. Fortunately the venom injected was less and the boy, who was temporarily blinded and had a swollen face, survived after staying in the temple for 48 hours. We cannot give the exact reasons for his survival since research on venom and its effect on human body are not much studied in India. Radheshyam was fortunate for not loosing his son, but there are thousands of unfortunate families who have lost their son, daughter, father or mother to snakebites in the rural areas of our country. Snakebite is one of the most underestimated causes of accidental deaths in modern India. It is a long neglected health issue across the country; World Health Organization (WHO) in 2009 added snakebite to the list of ‘Neglected Tropical Diseases’ (NTDs). Deaths and injuries due to snakebites are more than all the encounters and attacks from vertebrate animals in India put together. Recent “Million Death Study“, an initiative of the Registrar General of India (RGI) and the Center for Global Health Research (CGHR) at St. Michael’s Hospital and University of Toronto, Canada, estimated that the upper limit for snake bite deaths in India is 45,900 per annum (@ 99% CI 40,900 to 50,900). Loss of limb and other serious disabilities could affect another 200,000 to 250,000 victims of venomous snakebites. At the same time, the irony is that 2008 National Health Profile report from Government of India mentions a total of 1331 snakebite deaths in 2007 for all of India. No clear data is available due to poor reporting system and poor maintenance of hospital records. If we take these estimates of the Million Death Study, then there is one snakebite death to 2 Malaria/AIDs death in our country. But if you consider the funding, research and other measures that goes into reducing/preventing the deaths due to malaria & AIDS as compared to that of snakebite deaths, you will get a big ‘zero’. There is not a single research institute, which is dedicated to the field of snakebites; there is not a single authority that monitors the situation, to the extent that this topic is not even included in the undergraduate medical studies. If this is the situation in the health field you cant even imagine the lack of attention given to this human-animal conflict in the field of environment & conservation. This situation is a lost cause to all and mostly neglected at all levels. High number of snake species that can cause fatalities, present in and around agricultural fields. Dependence on traditional and quack treatments. And our own superstitions and mythological stories on snakes makes matter worst. Snakes are probably the most misunderstood and feared group of animals in the animal kingdom with whom we share our planet. What we need are trained medical personnel on snakebite management at Health Centers, availability of right quality and quantity of anti venom and an informed community for faster transportation of victim to Health Centers. Though this looks pretty straightforward, it has many complex issues, which need to be addressed at an institutional and community level. Let me try to discuss each of these issues separately. The problem starts at the medical education level itself; a chapter with mostly outdated and wrong information in third year of medical science course under toxicology is being used for last 4 decades. That is the first and last touch point for doctors who are supposed to manage any snakebite emergencies. There are efforts being made by Indian Medical Association, Maharashtra chapter and some other medical organizations but we are yet to see actual execution taking place at the ground level, which means changing the outdated and misinformed chapters by new facts and data. There is a dire need for inclusion of Snakebite management in medical syllabus and training all the “would be” doctors on this. The second major hurdle is lack of confirmed data on snakebite incidences with mortality & morbidity arriving out of such incidences. The first & foremost action – snakebite incidences and deaths need to be classified as ‘Notifiable disease’ so that it can be monitored and it can trigger institutional response in case of additional action/resources required. Third barrier is, misconceptions about requirement of snake identification for treatment. What we have as a treatment today is polyvalent Anti Snake-Venom Serum (ASVS), which means it can neutralize venom from the 4 common venomous snakes of India viz. Cobra, Krait, Russell’s Viper & Saw-scaled Viper. So there is no need for identification of species for treatment. Our efforts are towards moving medical fraternity from “Species Diagnosis” to “Symptom Diagnosis”. As per WHO snakebite management protocol, the symptoms of snakebite are quite well defined and the treatment should be planned based on the symptoms of being bitten by a venomous snake rather than the species of snake. We do not have a national policy and protocol on snakebite management, though there are efforts made by various organizations, they are yet to get acceptance at central & state levels. Today we have scarcity of good quality ASVS in our country. Whatever is available is made from venom acquired from snakes from Southern India. Now why do we worry about the source of venom? It’s because, the same species of snake shows wide variation in venom constituents in different geographies. Venom is complex mixture of proteins and enzymes, and these contents may depend on the prey base and temperature in that area. Injecting horses/mules with gradually increasing dosages of snake venom produces ASVS. This process is called hyper immunization. Horse/mule is capable of producing antibodies against these venom proteins, and thus we get the antibodies to use as ASVS. Therefore, in a layman’s language, if the base venom constituents change, then ASVS constituents will also change. Hence, the ASVS produced from South Indian snakes’ venom may show less specificity to venom of the same species from Central India or any other geography. These are assumptions based on very few studies done in India; we really need to increase our research in venoms and anti venoms for the larger public health interest. As I have mentioned earlier, these life saving serums are produced by using animals in the process. Snakes provide the venom and horses provide the antibodies. Hence, both the Wildlife Protection Act and the Animal Welfare Act come into play in the process. Both these acts are needed for the well being of these animals, but in process it also becomes a deterrent for producing these drugs in higher quantities. We need to change our attitude from ‘stop these’ to ‘regulate these’. There is no doubt that snakes will be stressed during venom extraction and horses will be troubled during the process of creating ASVS, but we cant completely avoid these for want of a life saving resource. Science has gone much ahead to reduce these exploiting factors. Now-a-days there is no need to extract blood in large quantity from horses for these serums, there are machines from which the blood is processed, antibodies are separated and blood goes back into the horse’s body. Venom extraction, if handled properly, does not stress snakes. Venom is a replenishable commodity for snakes. They keep producing venoms as we keep producing saliva. So in my opinion, we need to be positive while applying these laws in case of production of life saving drugs like ASVS and make the process of permissions much simpler and easier. In return, Government can control the prices or ask companies to subsidies the production which in end will reduce killing of snakes due to fear of death. Hence, we need venom from different geographies, better venom extraction methods and better production methods for Anti venom for making these life saving drugs available at every Primary Health Center (PHC) in optimum quantity and quality to reduce snakebite deaths. The fear & misconception about snakes are so deep in our culture that removing it will be a very herculean task. Also we need to understand that, till we don’t solve these deaths caused by bites from venomous snakes, it will be quite impossible to remove superstitions from the communities. It’s catch-22 situation, till communities don’t come out of this fear zone, deaths will not be reduced and till deaths are not reduced, fear will not be removed. What can be done in such a scenario? We need to go back to basics, start spreading awareness about snakes from primary school education. Such as what are snakes? How do they live? Why do they bite? Etc. If such information is taught through primary school education, we will be able to reduce chances of snake-human conflict itself. Simple precautionary measures while working in the fields or walking at night in villages can reduce chances of getting bitten and if they’re practiced from early age we may prevent large number of accidental bites. We also need to address faster reporting and transportation of the snakebite victim to the nearest treatment facility. A Self Help Group at every village can be trained for an emergency response team. Linking these teams to nearest PHC will help immensely for faster treatment. In a recent community based survey in West Bengal, it is reported that nearly 75% of the snakebite cases do not go to governmental medical facilities; they have strong beliefs in traditional faith healers or tantriks. Why do communities still believe in such practices? There are two reasons for this. If you take sample size of 10 people bitten by snakes, then the chances are only 3-5 out of them are bitten by venomous snake as approx. 25% of the species found around us are venomous and remaining are non-venomous. Out of those 3-5 people who are bitten by venomous snake, only 1-2 people actually show venomation as in nearly 50% of the cases no venom is injected at the time of bite, this is called as a dry-bite. So as per law of average, 8 out of 10 people bitten by snakes are going to survive after going to traditional faith healers and thus the community trusts them. We easily forget those 2 people who lost their lives due to venomation and lack of medication; however, these quacks blame such deaths to sins committed by the victims! The Primary health facilities are so much underprepared to treat snakebite victim, that people at large have lost faith in these facilities. Though the snake is a wild animal, an incident of snakebite usually does not come under the ambit of ‘wildlife conservation’. Whenever there is any human-animal conflict, there is a 99% probability that it is the case of snake-human conflict, either snake getting killed or human succumbing to venomous snakebite. Though I have seen many efforts have been made to address other wild animals-human conflict, I haven’t seen any major efforts done by conservationist & researchers to research the problem or creating advocacy campaign or making efforts towards policy change at institutional level when it comes to snake-human conflict. Even those involved in research, rescue and conservation of snakes don’t pay much attention to snakebite deaths in their areas. Snake conservation largely involves catching snakes in conflict situations and then dumping them into some forested areas or doing live snake shows for education purpose. Most of the time handling of snake takes priorities over its welfare. There are a few people who have understood the magnitude of the issue and are working towards snakebite mitigation in various geographies of India, but their number is very small. They will need encouragement, funding and support from all those who wish well for Indian bio-diversity. In the end people will argue that it is a health issue and not that of conservation, or it’s a wildlife issue and not that of health. I would like to point out following points for those who want to decide for themselves. Impact on bio-diversity – Thousands of snakes are killed across India due to fear of snakebite deaths, even though only a small percentage of them are venomous. Impact on community – A serious issue of mortality and morbidity in India, more than 50% of the incidences happen to people working in their agriculture fields and the resulting death is an irreversible impact on their families. Finally, it’s the right of human beings as well as snakes to coexist, which has been skewed at this moment due to the large number of avoidable deaths occurred. Should we just accept this scenario as a non-solvable problem or live in denial that there is no problem to solve? If we stay with those beliefs, some more families will be facing a loss of their loved ones to snakebites. Sadly at this moment I have come to the conclusion that this is a ‘Lost Frontier of human-animal conflict‘. But as an optimist I am sure that this lost cause can be found again with the combined efforts of health activists and conservationists working together for the betterment of people and conservation of snakes. Very interesting, nuanced, and informative article! Great going, Kedar! Interesting and very informative article. Message conveyed in a very fruitful way. A good analysis and need of the hour. Expertly written and very comprehensively addressed. Great read. Great to see this long-standing problem being brought to wider attention with a well-written and comprehensive article like this. As you point out, it is a very multi-faceted problem and requires co-ordinated action. This is very difficult to achieve in a country the size of India without clear leadership and advocacy from the central government. Research is hampered by lack of ability to get permits to do the necessary work, whether is involves collecting samples from snakes for basic biological investigations, detailed analysis of venom variation, efficacy of existing ASVS or clinical/epidemiological studies. The true scale of the problem needs to be more widely appreciated in order for the humanitarian benefits of the research to be clearly ahead of the animal welfare/conservation considerations that cause the neccesary permits to be withheld (and which modern methods can do a lot to mitigate in any case as large numbers of animals are not required). You have described the snake bite issue in a very detailed manner and its very informative. Thank you very much for this and it would be a nice idea if we can start as you said from teaching the basics-spreading awareness about snakes.